If you happen to follow me on the Periscope app (my username is @ErinSpain, come find me! 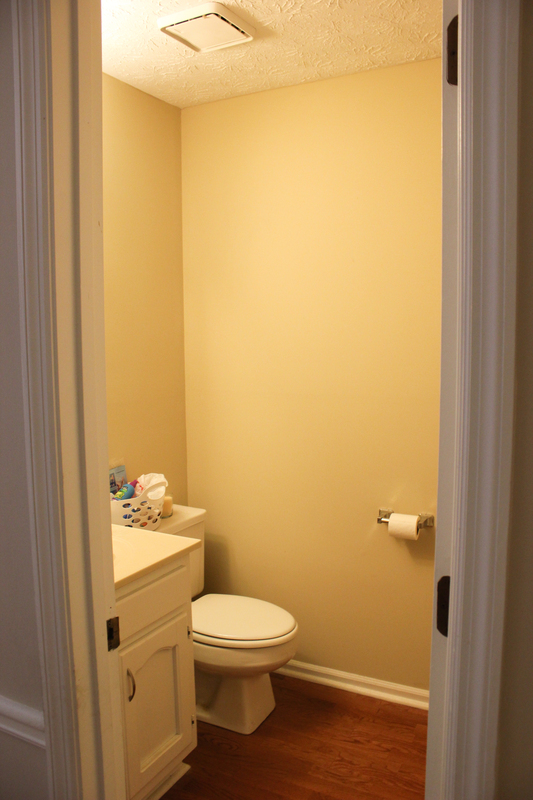 ), then you recently got a sneak peek of our downstairs half bathroom which we hadn’t even touched since we moved in last year. Then, I showed you how I finally painted the walls a couple of weeks ago. Well, the bathroom makeover is complete! Unfortunately, we couldn’t gut the bathroom and start from scratch like I would really love to. It’s not in the budget or high enough on the priority list at the moment, so I did the best I could with paint and accessories. First of all, please note that this space is nearly impossible to photograph. The bathroom is tiny and there is no natural light nearby, and I don’t have a wide angle lens, so I did the best I could. My new art from Minted found a spot on the wall in here for now. 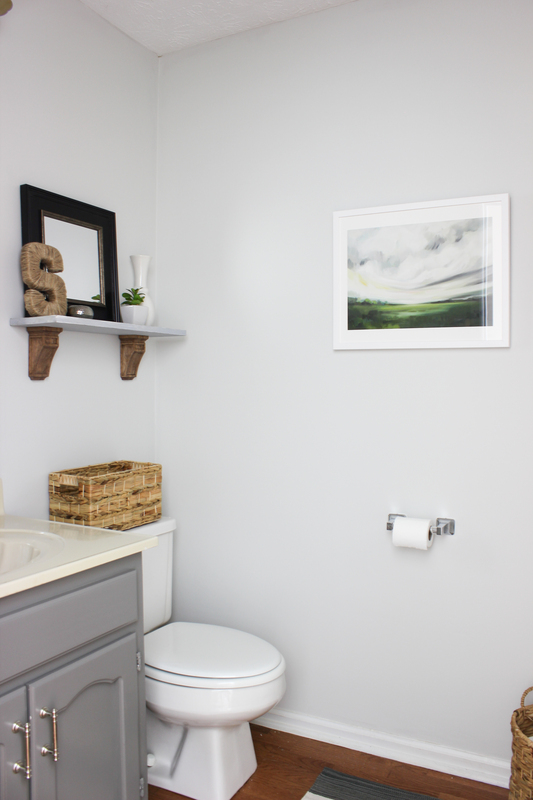 I know it seems a little bit strange to hang a nice, limited edition piece of art in a tiny powder room, but I had the art propped up in the hallway as I was planning to hang it in the bedroom, and I was scurrying around looking for something to hang on the wall in here when I spotted it. I thought, “hmm.. I guess I could try it,” and the colors could not have been more perfect. It just works here. This is our only downstairs bathroom so all of our guests use it and we walk past it constantly, so the art will be seen plenty. I haven’t decided yet if I will move it to our bedroom when I finish making that room over and then find something else to hang in here, but for now I really love it here. As for the bathroom, I painted the walls with Benjamin Moore’s Gray Owl (lightened by 50%) in an eggshell finish, and I painted the vanity Benjamin Moore’s Chelsea Gray (semi-gloss). I added new polished nickel cabinet handles from The Home Depot. This was a quick little makeover that was easy to complete over a weekend. 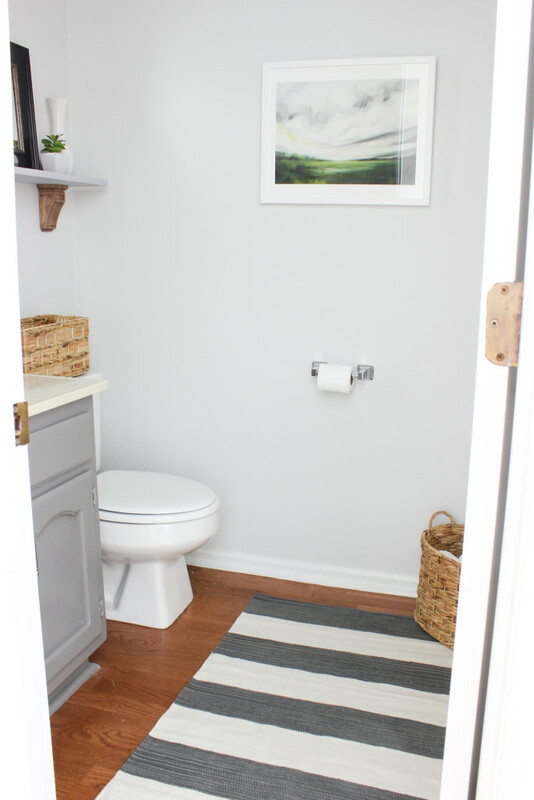 It’s amazing how a simple coat of paint can transform a space — especially a teeny tiny space like this one. Eventually we will replace the vanity and light fixture, but for now the few little changes that I made definitely make the space more inviting for guests (and for us!). Simple and beautiful! I love this look. 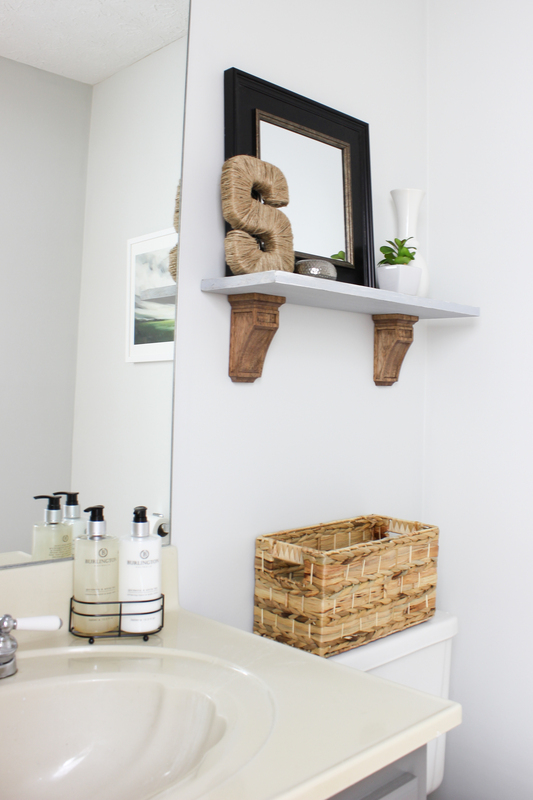 I need to redo our bathroom (we only have one!!!). I am loving the gray. Love the after! That gray vanity is fabulous!!! Thank you Jodie! I agree, paint is the easiest way to make a major change! this looks so much better! Love the shelf and the gray cabinets! your bathroom makeover was great. It’s amazing what you can do without having to empty your wallet. Our homes must have been built around the same time. My bathroom looked exactly like this before we remodeled…layout, vanity, mirror, right down to the exhaust fan! I love the neutral palette you chose. Looks fresh! Thanks Elizabeth! Our home was built in the early 1980s. All of our bathrooms look like this, so I will slowly be making over each one. Our master bathroom was halfway updated before we moved in but the vanity is still old, so I’ll get my hands on it eventually!